A crown is placed to prevent a tooth from breaking. As we get older, we are more prone to breaking teeth. If a tooth has a large filling, it is more prone to cracking or breaking. A crown, especially if it has metal in it, will help protect a tooth against breaking. Some people can break back teeth even if they have small fillings or no fillings in the tooth-their occlusion is that powerful. These are supposed to last for many years. If you have a large filling instead of a dental crown for your tooth, the filling may break down in a couple of years. Your tooth could also break, become infected, and then require a root canal treatment. Sometimes, when a tooth breaks, it becomes non-restorable. Here is a cut-away diagram to show you how a dental crown covers the entire tooth. 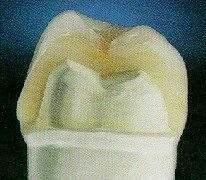 The tooth is shaved down, and the crown is cemented over the top of it, thus protecting it. This one is made of all porcelain, though they can be porcelain fused to metal, or all metal. The metal that is preferred for dental crowns is gold. When they are made of porcelain fused to metal, the underlying metal is often an alloy containing either gold, palladium, or platinum, or a combination of these. When the crown is a metal crown, gold is used for three reasons. First, it is a very workable metal. It can be burnished tightly to the tooth, and nothing fits better to the tooth. Second, it can be cast very accurately. Margins can be made very thin if necessary, and will meet the teeth precisely. Third, it will not corrode. For these reasons, dental crowns made of gold can last for many years. They are a protection for your teeth and can help insure that you keep your teeth for all your life. Many cheaper materials used for crowns have nickel in them and will provoke a metal allergy. Read Dr. David Hall‘s blog posts about dental crowns, where he answers questions from visitors.